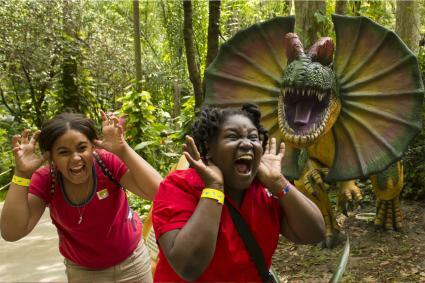 Dinosaur World is a chain of three dinosaur theme parks with locations in Florida, Kentucky, and Texas. Florida was the first location, which opened in 1998, followed by Kentucky five years later, and then Texas another five years after that. Fossil Dig: Kids can dig for fossils in a specialty area as part of this 15-minute guided activity included with admission. They can even choose three fossils to bring home as souvenirs! Dino Gem Excavation: Grab a full bag or bucket and run it through the mining sluice to see what treasures await: everything from minerals and gems to arrowheads. Guests can keep everything they find (included with excavation pass price). Bone Yard: Grab tools and start your own excavation. Dinosaur Walk: Explore this outdoor trail with life-size dinosaurs. Animatronic Dinosaurs Display: Animatronic dinosaurs populate the Prehistoric Museum (Florida and Texas only). Geode Cracker: Purchase a whole geode and crack it open (Florida and Texas only). Movie Cave: Enjoy a selection of dinosaur movies you can purchase in the gift shop (Kentucky only). Mammoths: Mammoth exhibits are available at the Florida and Kentucky parks. 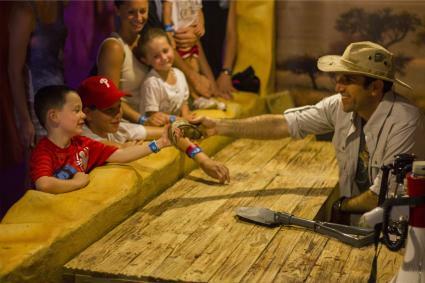 Cave Show: Florida has an exploration cave show and Triviasaurus Rex Game Show, both of which are interactive. Each park has a 5,000 - 7,000 square foot gift shop where you can purchase a variety of souvenirs and educational materials. There are lots of geodes and jewelry made with artifacts as well. For those who want to shop online, there is the Dinosaur World Online Store where you can shop right from your own home! Dinosaur World parks are dog friendly for those traveling with well-behaved, leash-trained puppies. Water stations are even provided. Ticket pricing and operating hours are relatively similar between the parks, but there are some minor differences depending on which one you plan to visit. Check the respective website for current specials and promotions. They typically offer specials like free admission for children aged 3-12 on their actual birthday (proof needed). There are annual passes available, and active-duty military with valid active-duty ID get free admission. Be sure to check when they update the reciprocal agreements for 2018 which offer discounts on admission at other designated nearby attractions and museums. Dinosaur World Florida is slightly more expensive than the other parks, but there may be some discounts available for other parks if you plan to visit other attractions in the area. If you want to stay nearby, Hampton Inn Plant City offers Dinosaur World guests up to 15% off on room rates, but you must call ahead and mention Dinosaur World. The park is open daily from 9 a.m. to 5 p.m., and it's important to note there is no food service in the park. Pack your own lunch or have pizza delivered. It's located in the greater Tampa area at exit 17 on Interstate 4 in Plant City, Florida, approximately a 20-minute drive from downtown Tampa and about 45-60 minutes from Orlando. Dinosaur World Texas is located near Dinosaur Valley State Park and is open from 9 a.m. to 5 p.m., closed Thanksgiving and Christmas Day. The closest major metropolitan area would be Dallas/Fort Worth. The Dino Gem Excavation is seasonal, despite Dinosaur World being open year-round. It will be closed January and February 2018, so it's best to call ahead for availability if you plan to visit during the winter months. The excavation passes in Texas are slightly cheaper than they are in the Florida park. Dinosaur World Kentucky is located near Mammoth Cave National Park, just outside of Cave City. They are open from 8:30 a.m. to 4:30 p.m., closed on Thanksgiving and Christmas Day. Like the other parks, there is no food available, so pack your own for a picnic lunch. 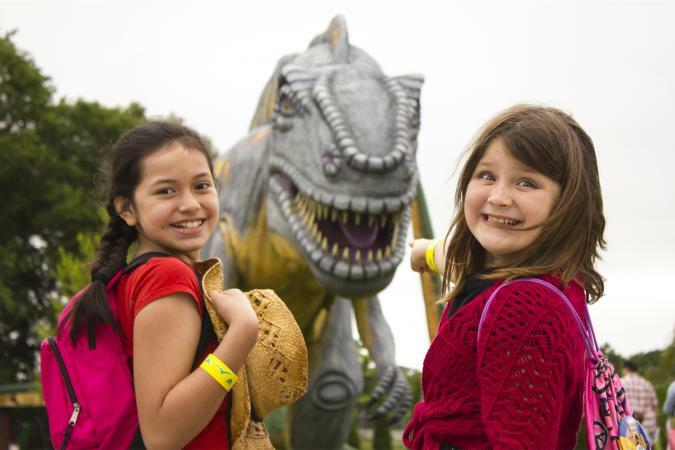 Even though Dinosaur World Kentucky is open all year, the Dino Gem Excavation is seasonal. Like Texas, it will be closed the first part of 2018, so call ahead to check if this is an important part of your plans. If you're looking for discount coupons to Dinosaur World, several websites may yield some results. Dinosaur World was rated as one of the top four dinosaur theme parks in the world by Maxim Magazine and republished on Fox News Travel. Visit the USA, which is the official travel site of the United States, has a great feature on spending a day at Dinosaur World in Florida for those who want more in depth information on visiting. Well-known travel blogger Shannon from A Little Adrift also has a thorough write up of spending time at the Florida park-she recommends spending about two hours there. User reviews of Dinosaur World Florida on sites like TripAdvisor are generally positive, but one user did note some attractions were not open after damage resulting from Hurricane Irma. Of the negative reviews, most people who rated it as one star felt it was overrated and overpriced for what you see and do. One user blasted Dinosaur World for mosquitos that were present during her family's visit. While the park obviously can't control the environment near Tampa, it's good to know that you may want bug repellent or long sleeve clothing for your family. There are only a small percentage of negative reviews from the Kentucky location, and complaints echoed those from Florida in that it was a "tourist trap" and the dinosaurs you see from the road are the best. Others highly recommend visiting, especially with kids. If you happen to be traveling through one of the cities with a Dinosaur World theme park, and you're traveling with young children, it could be a really fun and educational way to spend a few hours. The interactive exhibits with souvenirs your kids can take home will make lasting memories of your trip back to prehistoric times!